My sister and I just got back home from a ten day tour of Israel with Israel4All. I have multiple disabilities and like others have said here, I thought my traveling days were over. I am an amputee and half my abdominal wall was torn away from my pelvis leaving me with an enormous hernia which further decreases my mobility. Add to that being too large to fit into a standard sized wheelchair. I thought it was going to be impossible and everyone said I would never make it. Well, can't doesn't seem to be part of Eli's vocabulary. He arranged a heavy duty scooter that allowed me to go just about everywhere, and he made certain that every place we went was accessible and that our needs were met. When I asked for something, he would move Heaven and Earth to see that I got it. He is gentle and calm and puts people at ease immediately. He is extremely knowledgeable and displays a great love for Israel. You could search, but I believe you would never find a man more suitable for this profession. He sees people for their abilities rather than their disabilities. I am proud to call him my friend and would recommend him to you without reservation. A most heartfelt thank you to Eli and Israel4All. 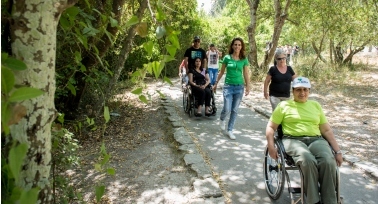 As a user of a mobility scooter I was extremely fortunate to have Eli guide my husband and I on various tours across Israel. Not only is he most knowledgeable and informative on this wonderful country, but he is as well such a caring and considerate man. He made sure that we were comfortable at all times and enjoyed the places we visited. He always went the extra mile and nothing was ever too much trouble. When a problem arose with the hotel where we were staying in Jerusalem , he and Janet immediately and most professionally arranged for us to move to a hotel better suited to our needs. We would love to return to Israel to see more of this both historic and modern land and we would most definitely use Eli again. L'hitraot - till we meet again! I am in a wheelchair and just visited Jerusalem for a week with my Mom for the first time. 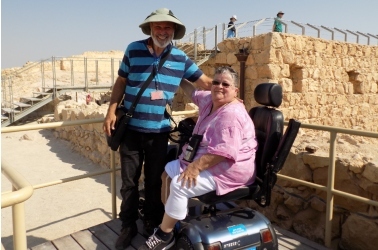 We had 4 days of private tours with israel4all, visited Old City, Mount of Olives, Garden of Gethsemane, Israel Museum, Sea of Galilee, Mount Beatitudes, Capernaum, Masada and Dead Sea. All amazing and beautiful sights accompanied by wonderful, informative guides Eli and Udi leaving us with some very precious memories! 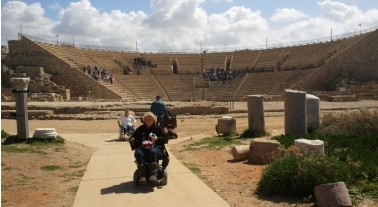 Janet organized everything really well from the tour to the airport transfers and also transfer to and from Yad Vashem. We thoroughly enjoyed ourselves and highly recommend israel4all! Thank you Janet, Eli and Udi for a fantastic and memorable time!! !